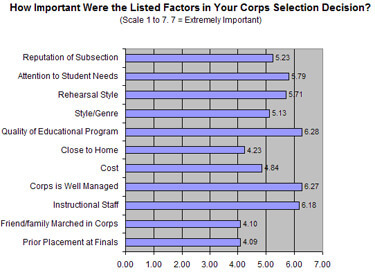 Project Persona: What is important when choosing a corps? This summer, Drum Corps International conducted an extensive research program designed to provide information and insights into the young people who participate in drum corps. Dubbed "Project Persona," the program is headed by Boston Crusader staff member, Chauncy Holder, and is part of his University of Wisconsin MBA course work. DCI invited more than 2,500 students participating in Division I drum corps to take an online survey this May. More than 1,000 students responded to the online survey portion of Project Persona.